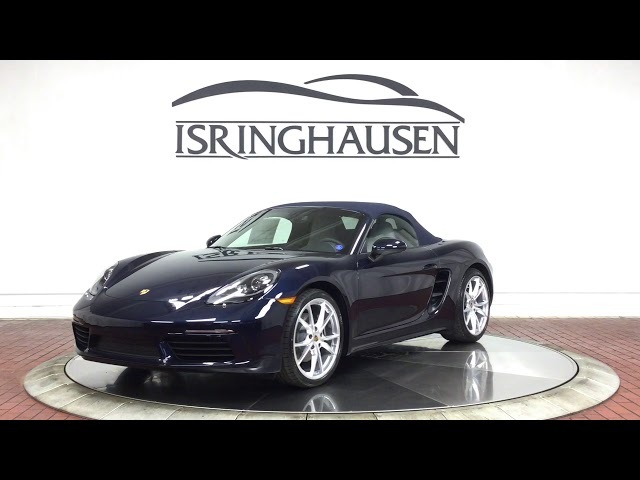 This beautiful 2019 Porsche Boxster 718 comes uniquely configured in Night Blue Metallic and contrasting Chalk Leather interior which sets itself apart from the others. Additional factory options include Premium Package Plus, 14-Way Power Sport Seats, Bose Surround Sound, Apple CarPlay, 20" Carrera S Wheels and more. Exceptionally agile, but still controllable. The new 718 Boxster combines comfort and driving pleasure in a way only a Porsche can do. Contact a Porsche sales specialist today by calling 877-362-9715. Isringhausen Imports is Central Illinois' premier new car, used car and certified pre-owned (CPO) dealership for quality BMW, Porsche, Volvo and Mercedes-Benz vehicles. At Isringhausen Imports, we have become a leader in the industry by working each day towards the greater good of our customers, our fellow employees, and our community.